How do I buy a Blaze Pizza Franchise? Buying a Blaze Pizza franchise means you get to own your own food franchise and become part of a dynamic organization dedicated to serving pizza in a completely new way. To buy a Blaze Pizza franchise investors need $30,000 for the initial franchise fee with a typical total investment of $319,000 to $858,000. The ideal size of each Blaze Pizza restaurant is between 2,200 and 3,000 square feet. 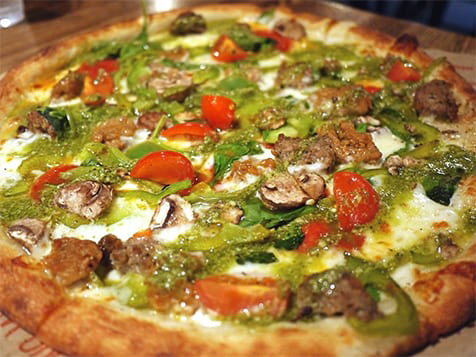 Blaze Pizza is a California-based franchise within the fast-casual dining sector which requires franchise owners to purchase 3-10 units in a period of 2-3 years. Blaze Pizza does not sell single franchises. 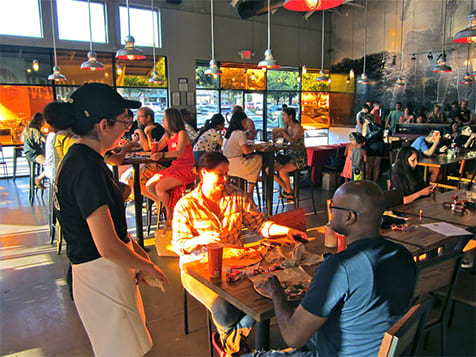 This modern day pizza franchise focuses on serving custom-ordered, amazingly delicious pizza quickly while also protecting the planet and connecting with its patrons. From its award-winning restaurant design to critically acclaimed chefs, Blaze Pizza is blazing a trail for the highest standards in the pizza industry. Open Blaze Pizza in any of these available states: AK, AL, AR, AZ, CA, CO, CT, DC, DE, FL, GA, IA, ID, IL, IN, KS, KY, LA, MA, MD, ME, MI, MN, MO, MS, MT, NC, ND, NE, NH, NJ, NM, NV, NY, OH, OK, OR, PA, RI, SC, SD, TN, TX, UT, VA, VT, WA, WI, WV, WY. When you join the Blaze Pizza franchise family, you'll have access to our brand, recipes and procedures, vendors, training, store build-out and trade dress, website, social media, online ordering and gift card program. But, most importantly, you get to be a part of a dynamic organization that is dedicated to serving custom-built, artisanal pizza in a completely new way. Blaze uses packaging that is recyclable, compostable and/or made from post-consumer reclaimed materials, and the straws, lids and cups are made from plants, not petroleum. 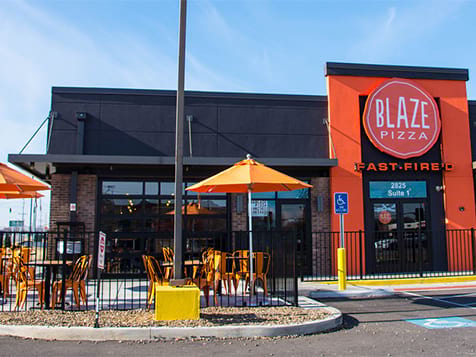 Blaze Pizza franchise provides two weeks of training at a facility in Pasadena, CA followed by two additional weeks of training at your store. If you are interested in opening Blaze Pizza franchises, Blaze asks that you meet the following qualifications. Blaze Pizza is not currently active in our directory, but here are some other recommended selections for you to explore.